This main part of this project was a survey of all prehistoric funerary and ritual monuments to assess their value, condition and vulnerability and to improve their description and understanding. In Gwynedd the survey was carried out between 2000-2003. In the following year a trial synthesis was carried out of data from the four WATs to confirm their compatibility with a view to a final publication for the whole of the project in Wales. In addition some topographic survey was carried out at Waun Llanfair, Llanfairfechan, Conwy. This was designed to support palaeo-environmental work carried out there as part of the project and the survey aimed to provide a better record of archaeological features in the vicinity. a. A project designed to improve the management of mountain-top prehistoric burial cairns. The survey had identified many such cairns as being severely damaged as a result of trampling by walkers and climbers who believe they are only modern summit marker cairns (FIG. 1). 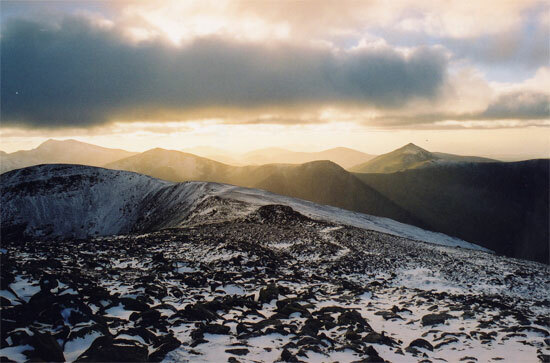 Better understanding was to be achieved by identification of mountain-top cairns at risk, by recommendations for management of those cairns and by production of an illustrated draft for a proposed published guide booklet to mountain-top prehistoric burial cairns in north Snowdonia. This would aim to make walkers and climbers aware of the true age and nature of such cairns and promote a Countryside Code of good practice towards antiquities. b. A local study of a particular area to promote knowledge of, visits to and care of prehistoric funerary and ritual monuments. This aimed to be a trial for a published local guide to such monuments, which might a model for similar guides in other areas of Wales. The area chosen was the Conwy Valley. This had the advantage of being a scenic and fairly well-defined area, close to centres of population, communication and tourism but one that presently lacked popular and easily available guides to antiquities. The final element of the work was production of an Action Plan summarising the main elements and recommendations arising out of the three years of the survey and produced as a report for Cadw. This was carried out in conjunction with production of similar reports in the three other archaeological trusts and these would all contribute to a final synthesis of the pan-Wales project.